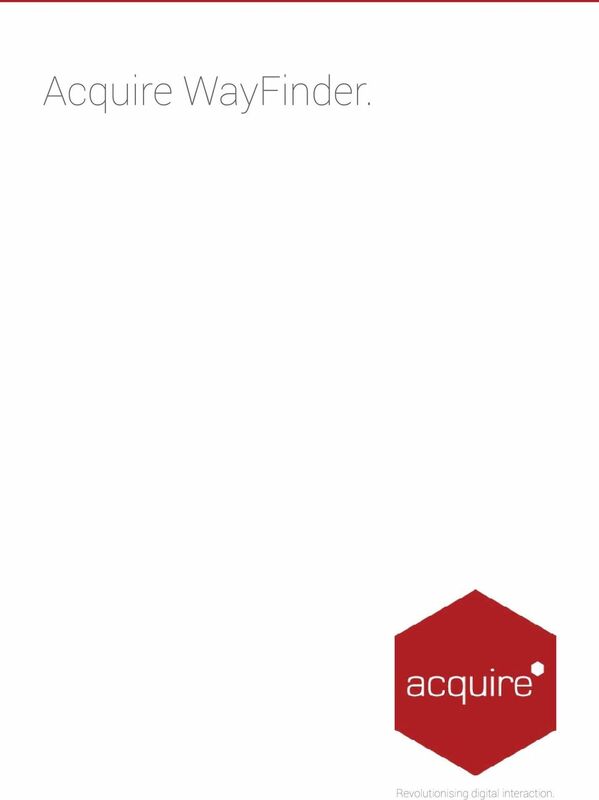 Acquire WayFinder. Revolutionising digital interaction. 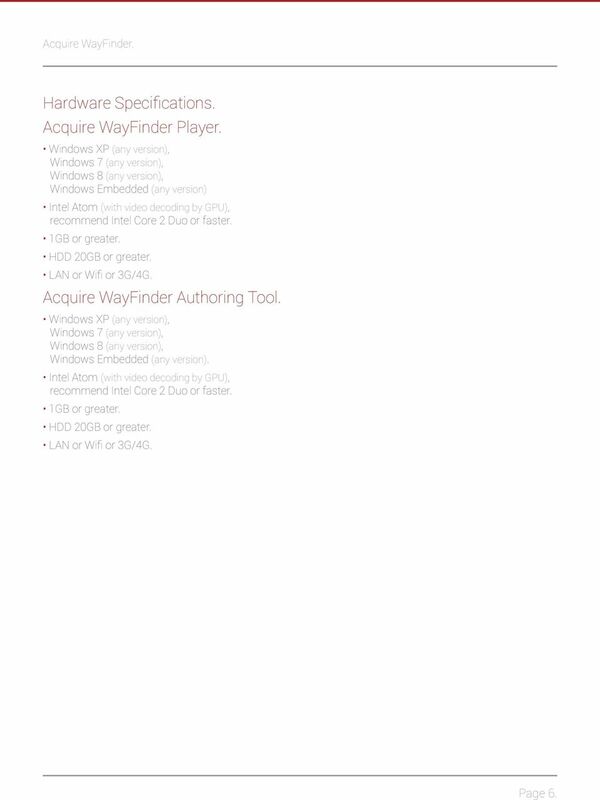 Download "Acquire WayFinder. Revolutionising digital interaction." 2 Interactive Touchscreen Maps. 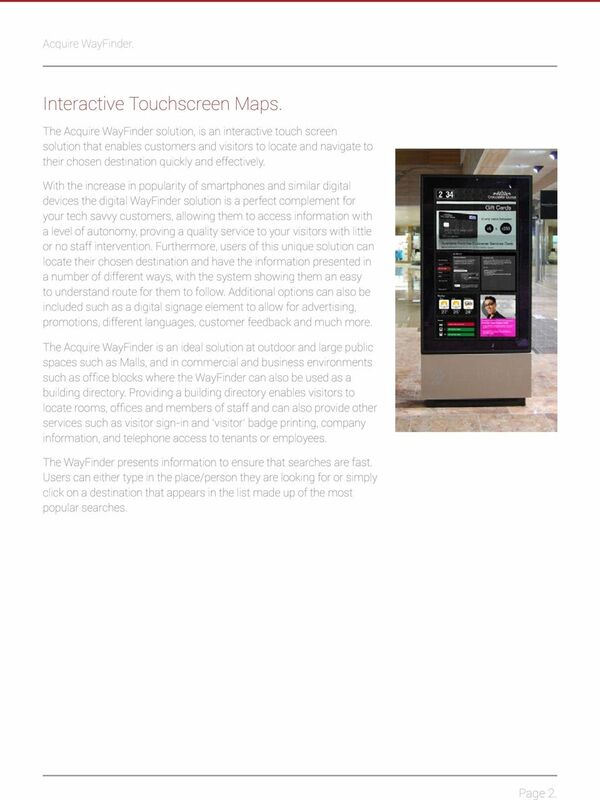 The Acquire WayFinder solution, is an interactive touch screen solution that enables customers and visitors to locate and navigate to their chosen destination quickly and effectively. With the increase in popularity of smartphones and similar digital devices the digital WayFinder solution is a perfect complement for your tech savvy customers, allowing them to access information with a level of autonomy, proving a quality service to your visitors with little or no staff intervention. Furthermore, users of this unique solution can locate their chosen destination and have the information presented in a number of different ways, with the system showing them an easy to understand route for them to follow. Additional options can also be included such as a digital signage element to allow for advertising, promotions, different languages, customer feedback and much more. The Acquire WayFinder is an ideal solution at outdoor and large public spaces such as Malls, and in commercial and business environments such as office blocks where the WayFinder can also be used as a building directory. Providing a building directory enables visitors to locate rooms, offices and members of staff and can also provide other services such as visitor sign-in and visitor badge printing, company information, and telephone access to tenants or employees. The WayFinder presents information to ensure that searches are fast. Users can either type in the place/person they are looking for or simply click on a destination that appears in the list made up of the most popular searches. Page 2. 3 The solution. The flexibility of our solution means that you have the freedom to create your very own WayFinder that fully reflects the intended environment, to enable customers to select a destination point, obtain information about distance and get a detailed route plan. Included are a choice of User Interfaces and methods of choosing the destination which are appropriate for many different intended uses. 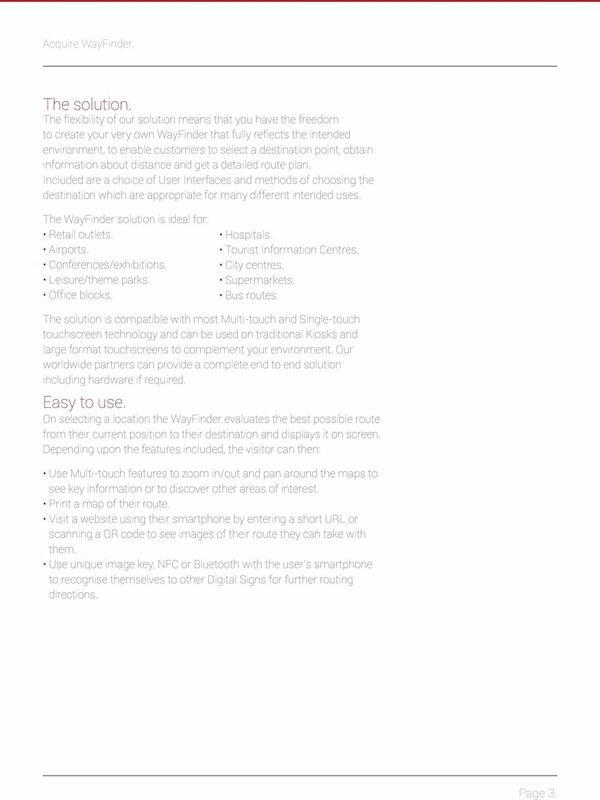 The WayFinder solution is ideal for: Retail outlets. Airports. Conferences/exhibitions. Leisure/theme parks. Office blocks. Hospitals. Tourist Information Centres. City centres. Supermarkets. Bus routes. The solution is compatible with most Multi-touch and Single-touch touchscreen technology and can be used on traditional Kiosks and large format touchscreens to complement your environment. Our worldwide partners can provide a complete end to end solution including hardware if required. Easy to use. On selecting a location the WayFinder evaluates the best possible route from their current position to their destination and displays it on screen. Depending upon the features included, the visitor can then: Use Multi-touch features to zoom in/out and pan around the maps to see key information or to discover other areas of interest. Print a map of their route. Visit a website using their smartphone by entering a short URL or scanning a QR code to see images of their route they can take with them. Use unique image key, NFC or Bluetooth with the user s smartphone to recognise themselves to other Digital Signs for further routing directions. Page 3. 4 The Technology. Using the WayFinder Authoring tool, you can personalise and configure every aspect of the User Interface presented on the touchscreen, by choosing designs and layouts to match your hardware, and by incorporating your logo and branding. The Authoring tool is then used to create a virtual environment within the WayFinder technology that mimics your real world environment. Details about routes and destinations can be entered, together with information about all the destinations so that visitors will be able to find their chosen location quickly. The map designer allows the physical aspects of the environment to be drawn from existing printed maps and then converted into a 3D or 2D map to be used in the WayFinder system. Each area on the map can then be linked to the destinations provided and can be changed at any time within minutes. Once this is complete, each of the WayFinder devices are registered with the Authoring tool and their locations plotted on the virtual map. 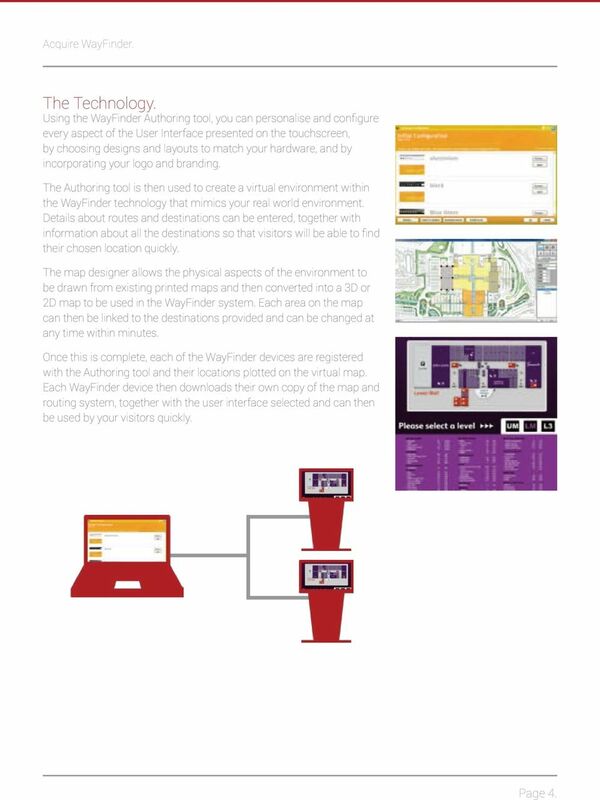 Each WayFinder device then downloads their own copy of the map and routing system, together with the user interface selected and can then be used by your visitors quickly. Page 4. 5 Customisation. One of the advantages of the WayFinder solution is that it can also be completely personalised by utilising the Acquire Editor Suite. This allows the same WayFinder to be used for a range of functionalities such as providing live information, taking customer bookings, a checking in facility, a place for your customers to leave feedback, coupon delivery, and as an effective advertising platform. Updates can be maintained by either internal staffing or outsourced to online service companies. When utilising more advanced features, we understand that you may not have the skills available to you, so we, or our selected Partners can assist with fully customising a solution to your needs. Automatic monitoring and support. We understand that although most installations will be local to the site, some will be centrally managed for multiple locations. In either case, updates need to happen smoothly, and systems need to keep operating. With our optional PLUS! Network technology, we can provide you with the reassurance you need that your WayFinder solution is operating smoothly. The Acquire WayFinder Player incorporates auto recovery features and built-in secure network connectivity to equip you with real-time alerts, remote device monitoring and control. With instant notification of any issues, you can resolve them straight away from a remote PC to minimise any potential downtime. You can also make remote changes to your content, playlists and playout schedule. PLUS! Network. The PLUS! Network is available as a managed service or you can purchase the server software and host it yourself. It provides fast, secure and reliable content delivery to your remotely installed Players via any TCP/IP based network. It also provides an integrated alert and support management platform with remote access of the players. 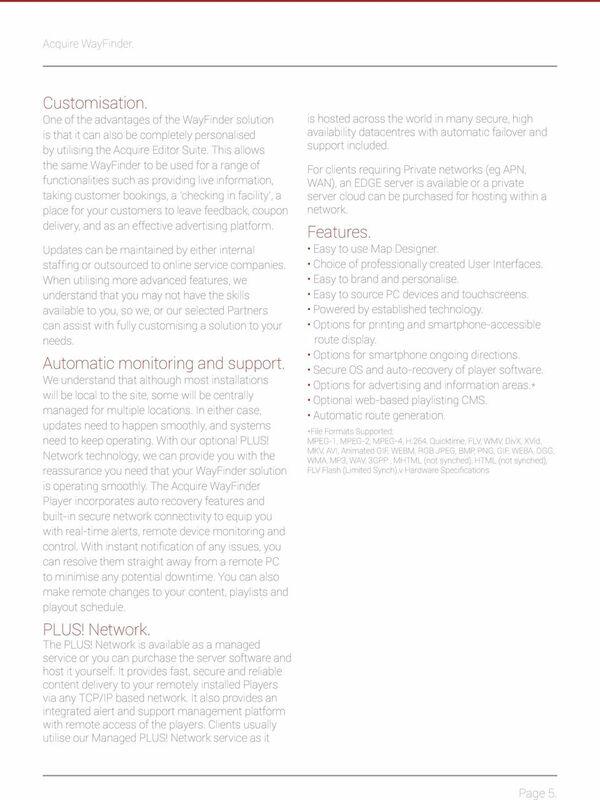 Clients usually utilise our Managed PLUS! Network service as it is hosted across the world in many secure, high availability datacentres with automatic failover and support included. For clients requiring Private networks (eg APN, WAN), an EDGE server is available or a private server cloud can be purchased for hosting within a network. Features. Easy to use Map Designer. Choice of professionally created User Interfaces. Easy to brand and personalise. Easy to source PC devices and touchscreens. Powered by established technology. Options for printing and smartphone-accessible route display. Options for smartphone ongoing directions. Secure OS and auto-recovery of player software. Options for advertising and information areas. * Optional web-based playlisting CMS. Automatic route generation. *File Formats Supported: MPEG-1, MPEG-2, MPEG-4, H.264, Quicktime, FLV, WMV, DivX, XVid, MKV, AVI, Animated GIF, WEBM, RGB JPEG, BMP, PNG, GIF, WEBA, OGG, WMA, MP3, WAV, 3GPP, MHTML (not synched), HTML (not synched), FLV Flash (Limited Synch).v Hardware Specifications Page 5. 6 Hardware Specifications. Acquire WayFinder Player. Windows XP (any version), Windows 7 (any version), Windows 8 (any version), Windows Embedded (any version) Intel Atom (with video decoding by GPU), recommend Intel Core 2 Duo or faster. 1GB or greater. HDD 20GB or greater. LAN or Wifi or 3G/4G. Acquire WayFinder Authoring Tool. Windows XP (any version), Windows 7 (any version), Windows 8 (any version), Windows Embedded (any version). Intel Atom (with video decoding by GPU), recommend Intel Core 2 Duo or faster. 1GB or greater. HDD 20GB or greater. LAN or Wifi or 3G/4G. Page 6. 7 About Acquire Digital. 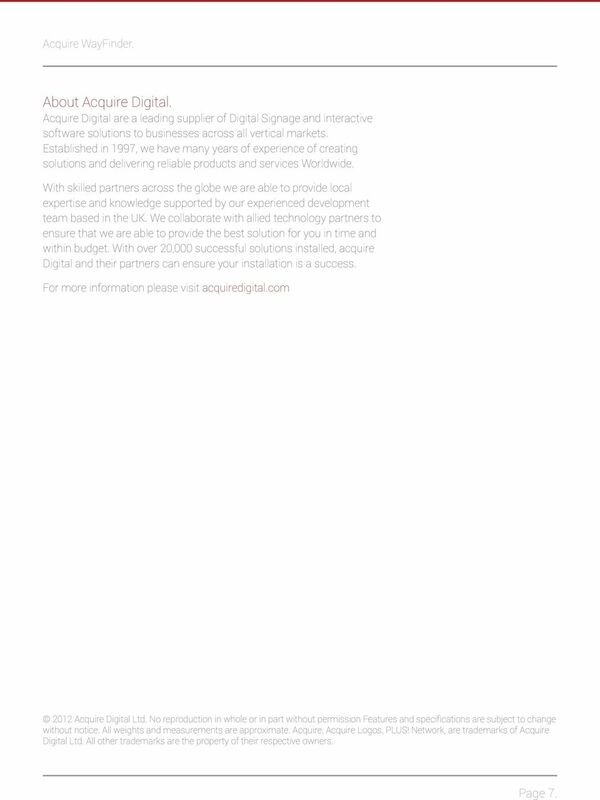 Acquire Digital are a leading supplier of Digital Signage and interactive software solutions to businesses across all vertical markets. Established in 1997, we have many years of experience of creating solutions and delivering reliable products and services Worldwide. With skilled partners across the globe we are able to provide local expertise and knowledge supported by our experienced development team based in the UK. We collaborate with allied technology partners to ensure that we are able to provide the best solution for you in time and within budget. With over 20,000 successful solutions installed, acquire Digital and their partners can ensure your installation is a success. For more information please visit acquiredigital.com 2012 Acquire Digital Ltd. No reproduction in whole or in part without permission Features and specifications are subject to change without notice. All weights and measurements are approximate. Acquire, Acquire Logos, PLUS! Network, are trademarks of Acquire Digital Ltd. All other trademarks are the property of their respective owners. Page 7.
system monitor Uncompromised support for your entire network. system monitor Uncompromised support for your entire network. CONTENTS. Introduction Uses How it works Site Manager PLUS! Network Watchdog System Requirements 4 5 6 7 8 9 10 system monitor INTRODUCTION. plusnetwork Safe & secure content delivery. Web Conferencing from Brother BOARDROOM QUALITY WEB AND VIDEO CONFERENCING MADE EASY. WHY MEET ONLINE? Until now, many experiences with web and video conferencing have been disappointing and frustrating. Key Features. PSX Mobile Marketing is focused on flexibility and ease-of-use for our Businesses/Merchants, Wi-Fi Hosting Sites and mobile users. Page! 1 of! 17 Digital Signs 101 Learning the Content Manager Express (CMX) Web App Enterprise Digital Signage Training Prepared by: Matt Gorney, Coordinator, Digital Media Services (DMS) ver4. 2015 Page! Be amazed. The Ziris Canvas video wall. Driving the Creation of Knowledge. vsolution Cynap Connecting media - connecting minds. AirMedia-350 1.3. Network Multimedia Player 2.5 /3.5 SATA HDD Media Station HDMI. USB Host x2. USB Client x1. Wi-Fi (Optional) 10/100 Mbps. Cascade Collaboration Solutions 5 Aug 2014 5530001600 Rev 03 Contents 1. Solution Overview... 3 2. Collaboration End Points... 5 3. Collaboration Cloud Server... 7 4. Technical Specifications... 8 4.1.